My 14 year old son took this picture a few days after we moved into our home. That was approximately six months ago. A simple story really, he was just taking pictures of the new surroundings with my camera. 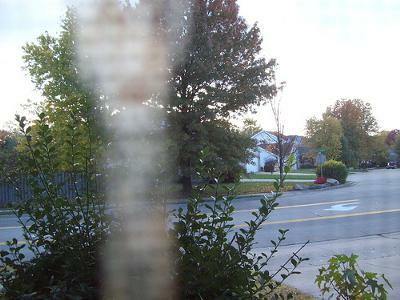 This picture in particular was taken through the living room window, the window was open and the screen was closed and it was taken close to the screen. If you look closely you can see the box weave pattern of the screen. The problem I have with the picture is that first of all, it looks like some kind of old woman in a way and my son is a 14 year old with dark brown hair. I would like to believe it's a reflection somehow, but of what? There were no pictures on the walls if it could have some been a reflection of something behind him. There wasn't even any furniture set in that room yet except for a computer desk, a couple of boxes on the floor and that's pretty much it. Nobody in the family is elderly or has white hair ... so what is this? I would NOT like to think it's a ghost, I have to live here. I have always been a skeptic of such things and I'm a skeptic of this as well, but there have been things happen here I haven't figured out an answer for yet. There was one time my bedroom door slammed shut and I mean hard, violently for no reason and that happened about around 3am when the only ones up were my fiancee and I. The other notable occurence was three nights ago. It was around midnight and I went to take a bath and relax, kids were asleep... and as I was sitting there I thought I heard a young girl's voice. Couldn't make out the words... but I thought maybe it was wind or something. It was weird so I got out of the tub, went into the kitchen and my son was at the table. He told me he heard a girl's voice downstairs and he was scared. I asked him if he could hear what the voice said and he told me it sounded like she said, "Why did I do this?"... so I don't know. I still want to believe there's a logical explanation for these things and maybe there is, but as for the picture... if anyone has some photo software they can run this through and maybe figure out what caused the weird image I would be very appreciative. I can't see a ghost there in the window. If I were you I would rather move out with my family than live with ghost. Lovely picture of a camera strap. I believe this is a reflection from the sun! Off of either a car or something else. I hope this helps you. I kind of see a dog. Right at the top of the blur it looks like it has eyes, and ears. I could just be seeing one because I just lost my 7 year old dog, on october 20, so thats what first pops in my head. Possible the reason why it was up for sale is because the people didn't want to live there anymore, maybe that was their dog. I might just be thinking this because i think it will start happening to me. I hope i gave you a little something to go off of. I agree with one of the aforementioned anonymous comments. I would have to say it more than definitely is the camera strap in front of the lense. I have done this myself accidentally on many occasions. It's all too easy to do. I know exactly what it is. It is bird poop on the window screen. It is the exact shape of what bird poop does when it hits a screen. It is running down the screen. Mystery solved. I don't see any box weave pattern or old woman but I see a man with long neck wearing a black T-shirt. He kinda looks blurry. Can you see it? it's probably just junk in the screen. Even just water can give an effect with a blurry pic. Like the yogurt ghost, though, it's still pretty cool. i dont know? but if you look carefully in the background, you can see a man in a garden wearing white. can anyone else see this? great picture. if you look at the back of the photo, it looks like a old man or something in the garden? can anyone else see it? I love it when people speak up and say what they see - both ways. But especially when someone doesn't see a ghost when they can say why, very analytically like you just did. It just makes me proud. Maybe I need a vacation, or maybe it's because there's something valuable in that - like having your own mind. My point is . . . see what you see. That's what our contributors are asking for: respectful, analytical truth. Could be a reflection of some sort from the flash bouncing off the screen. No way can it be the cord of the blinds, doesn't even begin to look like a cord of any kind. I saved the picture and darkened the glare, looks like two faces on top of each other. The top face looks a bit like an old woman or man, the bottom face maybe a child but clearly two faces of some kind, from who or what I can't say. Very interesting picture indeed. You can see the square weave pattern of the screen, but you can't see the obvious weave pattern of the string? Its wide and regular, which probably means that it was the cord from the blinds hanging down. He's right. Maybe u should put a tape recorder up, u never know what you'll HEAR of FIND. Anyway, that was an AWESOME PIC!!! If u look closely, u can see some eyes, a nose, and a mouth. I dont know why his neck will be soooo long. be a man wearing a suit and tie. Either way, it's an interesting picture. Maybe you could set a tape recorder up in the basement or living room before you go to bed at night. Try this for a week and see if you can pick up any sounds. If you do, then maybe you could set up a video cam. I am stumped. I can see the screen in the pic, and while this could be the image of a young man (not an old woman) I don't see how this could be reflection. I'm stumped. Perhaps our visitors have an idea.